Toronto blogger Veronica Cizmar runs Some Like It Vintage, an online boutique and consignment shop. 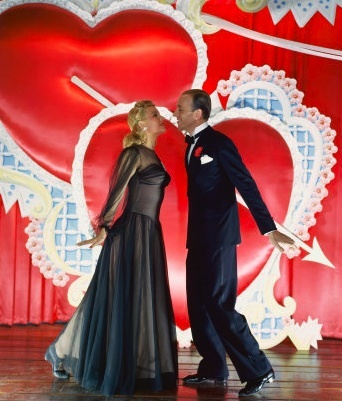 Today, she shares her secrets for retro romancing. We all know the day, that special day for lovers and couples. There is many a man and woman who work hard to make February 14 the most romantic day of the year. But the pressure can be overwhelming—with all the anticipation, planning, and preparations, from making dinner reservations at the perfect restaurant to coming up with the perfect outfit and shoes. For women, this might seem daunting, but for men, it’s like having a performance review! How do you top last year? Are you going to pop the question? Whew! That’s why I’m recommending you stay home for the holiday, and have a vintage Valentine’s that’s both inexpensive and romantic. Here are my tips how to create the right atmosphere, menu, and activities for your retro evening in. Invite your sweetheart for a special evening using a vintage Valentine card. If you have time, put it in the mail, the box thingy on the street corner, not email. You will have to buy a stamp. 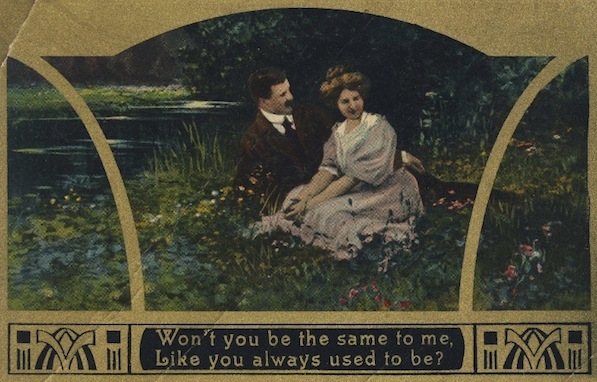 Say it with a vintage Valentine card or postcard. 1 heart-shaped box of chocolates. Flowers and a chilled bottle of Bollinger Champagne. Doris Day and Dean Martin records. Bring out your vintage cookbooks in the kitchen, and smell your way to a lovely casserole. When was the last time you had one of those? Mmmm! Flipping through a 1960s Better Homes and Gardens reveals the classic Tuna Noodle Casserole, Lobster Newburg, and Macaroni and Cheese. Iceberg lettuce is a must for your salad, as is a dessert—preferably made of strawberry jello in the shape of a heart. 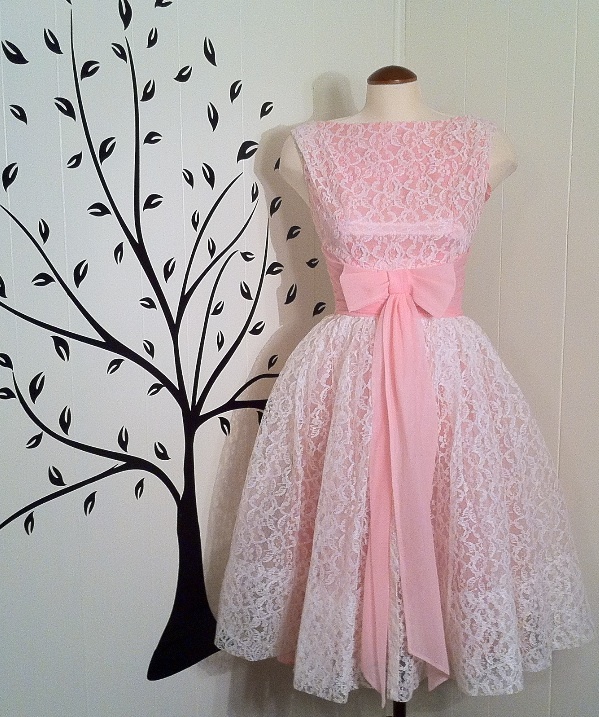 For the ladies, pink or red is the color of the evening, and for a truly retro look, make it a chiffon swing dress with matching gloves and kitten heels. Frilly, lacey, pretty, and girly. Gents, put on a tie, slacks (yes, slacks, not pants), and a pressed white shirt. The dinner jacket is optional, for there may be dancing later on as you swing your date into your arms, à la Fred Astaire and Ginger Rogers. Now comes the difficult part. What sort of friendly retro competition can help you avoid playing a video game, checking your email, updating Facebook, or turning on the television for an evening? Answer: A vintage board game. Remember those? Monopoly is still the No. 1 board game of all time, followed by Clue, Life, Scrabble, and Trivial Pursuit—probably the last great board game ever made. Vintage games are classic because their fun-o-meter stands the test of time. However, if board games are not your style then by all means, default to a classic romantic movie. Any one of the following movies will set your hearts aflutter and allow you to gaze into the dazzling eyes of your date: “Casablanca” with Humphrey Bogart and Ingrid Bergman, “Roman Holiday,” with Audrey Hepburn and Gregory Peck, “The Philadelphia Story,” with Katherine Hepburn, Cary Grant, and James Stewart; “Gilda,” with Rita Hayworth and Glenn Ford, “An Affair to Remember,” with Cary Grant and Deborah Kerr, “Sabrina,” with Audrey Hepburn, William Holden, and Humphrey Bogart, “Singin’ in the Rain,” with Gene Kelly, Debbie Reynolds, and Donald O’Connor, or “It Happened One Night,” with Clark Gable and Claudette Colbert.